If we buy key pieces that we can pair with different things, our closet becomes HUGE. Also, I'll include the links so you can check out the outfits if you haven't :). I wanted a denim vest so bad; but I was super picky about it- it had to be certain length.. certain color... obviously, I couldn't find it at first. I love this piece A LOT, I think it gives something extra to any outfit. En esta sección les muestro las diferentes formas en que he usado cierta pieza. Si compramos piezas claves y somos creativas combinándolas, nuestro closet puede hacerse mucho más grande. También incluí los enlaces para que vean los outfits si todavía no los han visto. I love this vest... I too have been looking for the perfect denim vest to no avail... I have even thought of making it one of my DIY projects!! Where did you find this vest? I would love it if you would consider posting the brands/stores that you purchase your items. It would be so helpful for those of us who are trying to recreate looks! El primero, de Victoria's Secret de Bombshell tour, aunque también me gusta como te queda con los otros. Me encanta tu forma de vestir!, he aprendido ha hacerme muchas cosas en el pelo gracias a tus vídeos en YouTube, a ver si subes mas.. que tengo ganas de ver nuevos peinados!!! eres una chava muy guapa y fresca, me encanta k muestres como repites tu closet!!!! pd. estoy por comprarme unos oxford pero no tengo muy clara la idea de como combinarlos, ojala y puedas orientarme. aLL!!!!!!!!!!!! ggg i love Victoria's Secret de Bombshell tour look............the best!!!! Todos son muy lindos, y es que un chaleco de mezclilla es muy versátil! Pero me quedo con el primero por que la fedora y los cargos son de mis favoritos ultimamente, besos! It's amazing how many beautiful outfits you were able to come up with such a versatile denim vest. Looking gorgeous! Estás preciosa en todas las fotos, me encanta tu estilo. 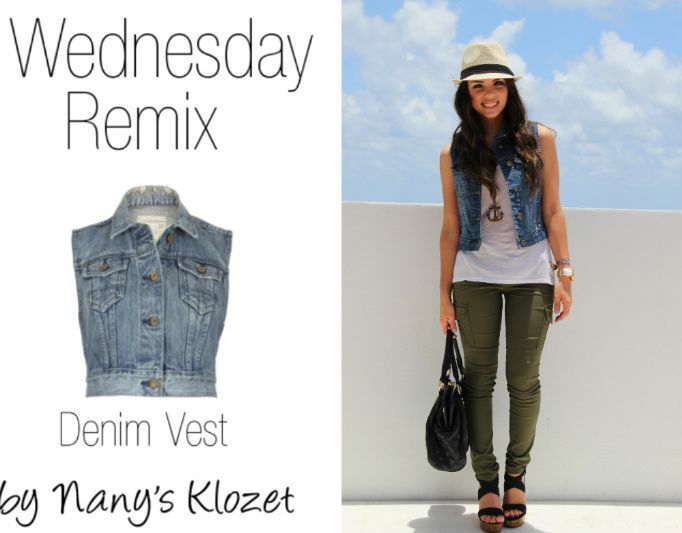 Denim vest are super versatile! Good pick! Aunque luces fantástica con todos ellos, mi favorito es el del vestido blanco! I love how you can pair denim with ANYTHING! Choose the look of the dress seems blanco.me is a style that can be used both for changing day to night whether any of these schedules for shoes, bag and maybe the hair. I love your vest! I think my favorite one is the one with a white skirt! Amo tu blog y quisiera poder ver más fotos con zapatos bajos, sandalias y bailarinas (baletas) o consejos para niñas un poco boluptuosas como yo!